The European Union has carried out its threat to freeze any assets held in the EU by Belarus President Alexander Lukashenko and 35 of his top aides. 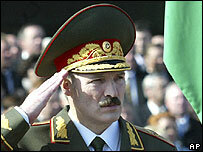 The move follows his re-election in March, which the Belarus opposition and Western observers said was rigged. The EU imposed a visa ban last month on Mr Lukashenko and his top aides. Correspondents say the Belarus leaders are unlikely to have assets in the EU. So the latest move is seen as largely symbolic. The visa ban means Mr Lukashenko and 30 ministers, prosecutors and election officials cannot enter EU countries. The list includes: Mr Lukashenko's chief of staff Gennady Nevyglas, Education Minister Alexander Radkov, Information Minister Vladimir Rusakevich, Justice Minister Viktor Golovanov, head of state television and radio Alexander Zimovski, Belarussian prosecutor-general Pyotr Miklashevich and KGB security service chief Stepan Sukhorenko. The EU had earlier banned six Belarussian officials. Mr Lukashenko was returned to office for a third term with 83% of the vote, but the OSCE, Europe's main election monitoring body, said the elections were "severely flawed". The result sparked demonstrations in the capital, Minsk, and hundreds of opposition supporters were arrested.